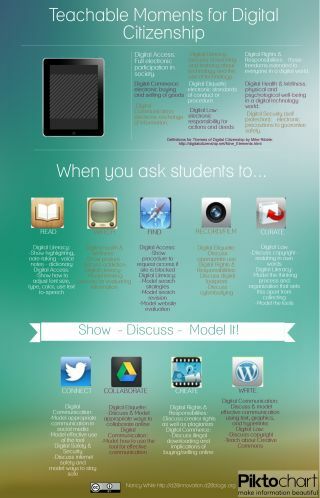 In preparing for professional development on the topic of Digital Citizenship for teachers in our 1:1 iPad pilot next school year, I have been searching for a resource to share on the importance of modeling these skills. While there are some great resources available for teaching Digital Citizenship as a separate curriculum to students (Common Sense Media, KidSmart, and Digizen to name a few) I know that teaching in isolation is not usually as effective as taking advantage of teachable moments – when students are actually online and pursuing a learning task to reinforce appropriate behavior, safety, and application of skills. I didn’t find what I was looking for – so I decided to create an infographic. I used Pictochart – great tool! Here is a direct link to the infographic on the site.